Espiritus del Ande There are 2 products. Espíritus del Ande is an incense made of sacred plants growing in the Andes, onthe basis of Palo Santo and Wiracoa. This incense blend is carefully mixed with Palo Santo - Wiracoa - Myrrh. Espíritus del Ande is handmade in Peru. 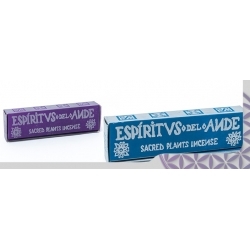 Espíritus del Ande is an incense made of sacred plants growing in the Andes, onthe basis of Palo Santo and Wiracoa. This incense blend is carefully mixed with Palo Santo - Wiracoa - Rosemary. Espíritus del Ande is handmade in Peru.